In today’s multi-channel, 24/7 news cycle, it can be difficult to get your company story to stand out, much less get it shared by media outlets. Keith and Chris Blackman are brothers who, combined, have a lifetime of media experience. They both have extensive backgrounds in network television, although they had different career journeys before segueing into media relations and PR roles – “what my friends at NBC call the dark side,” Keith says. Now, as Principals of Blackman Media Consulting, they are much sought after for their strategic media training and storytelling skills. And in today’s episode, they share their perspective on what it really takes for any company to build that buzz and foster ongoing momentum. The common denominator between every step in Keith and Chris’ career journeys is storytelling. The biggest challenge that they see today is that most people have forgotten to tell a good story - and this exists among PR professionals and clients alike. The pitches don’t have a beginning, middle, and end. So when they start working with a client, the first question they ask is, "What's your story?" A surprising number of people don’t really have an answer to that question, or at least not a concise answer. Whether clients are challenged with seeing the big picture or have had an inside-out view for too long, it all limits their ability to identify the right narrative for their business. It often takes an outsider’s perspective to see everything an organization has to offer and distill what it’s all about into a pithy elevator pitch. “They're so internally focused and engaged in navel-gazing that they haven't taken that time,” which is a familiar story across pretty much every industry. Media outlets and journalists aren’t looking for a press release or a commercial at all – they're looking for a story! There are also common myths and misconceptions that clients have when it comes to getting media coverage that Keith and Chris have to dispel. Second, clients want to shoot for the big national hit right out of the gate. They’ll often say, "Hey, how do I get on the Today's Show?" And a couple of years ago, it was, "How do I get on Oprah?" With so many platforms to tell your story, particularly at the local and regional level, Keith and Chris are constantly dispelling the notion that a big national hit is the end all be all. In fact, getting coverage doesn’t start with a big bang. Starting small and iterating with a local audience will help you hone your message as you build your strategy. 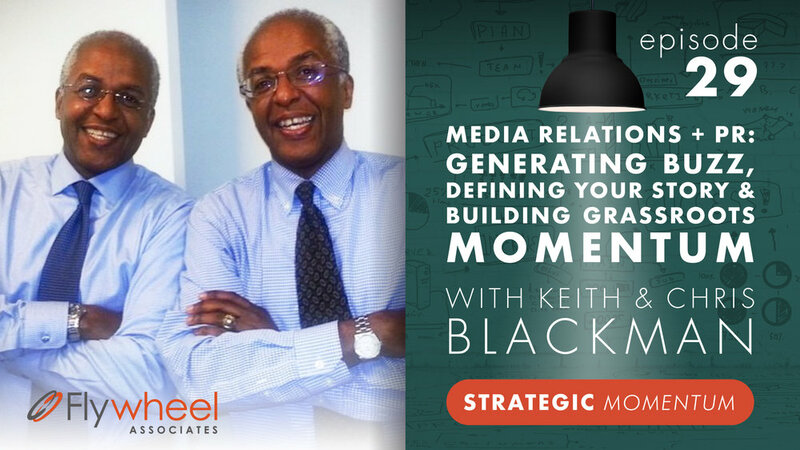 It’s critical to identify who your story is intended to reach, and that’s another challenge that the Blackman brothers have to help their clients overcome. Your story may play on various fronts. So don’t focus on just one reporter beat – you may have a compelling CEO story, a great consumer-facing story, and a human interest angle, for example. This allows you to maximize your coverage and it gives you the traction, credibility, and momentum necessary to leverage the network effect and amplify your message further. Think strategically about your media opportunities: What reporters do you want to reach? How do you want to reach them? And what story do you want to tell? Because it all goes back to the story. Once you get that lined up, it becomes much easier to know who to go to and what to go to them with. Media coverage doesn’t start with a big bang, so don’t let the desire for instant gratification on social media or national television overshadow the need for a strategy! It’s having that longer-term view rather than a quick hit. Take a test and learn approach and iterate along the way. Start at the local/regional level. Get practice and get traction. It shows that you have a track record and data points related to your story. And, if your story resonates with people, it may get picked up by more outlets, broadening your reach and extending the life of the story. Be aware of the network effect of interconnected outlets. By building some buzz in smaller markets, you build credibility and legitimize the story for larger markets. Make the process of gathering information as easy for the reporter as possible. If they ask you for clips of your potential spokesperson speaking so they can assess their articulateness or how they are on camera, you need to be able to provide that. Otherwise, you’re just creating a roadblock. Digital and social are critical to any media relations and PR strategy, from who you can pitch to the outlet you use, because it’s created a wonderful way to connect with reporters. Make yourself part of the dialogue that's happening in the news cycle right now versus trying to craft your own story thinking that's going to take the lead. Master the art of media training. Before you start pitching your story, make sure the potential spokespeople have honed the skills that are needed to speak in a concise and disciplined way. “So, a lot of what we do is training our potential spokespeople to have that built-in discipline and stick to a key message ... an interview is not the place for an original thought,” Keith says. Demonstrate to reporters that you understand what they are interested in and what they want. So take the time to research that reporters’ beat – know that their particular biases and focuses are. You need to make sure you are speaking directly to them. Getting a media hit is just the beginning! It's very important to then push it out, and push it out strategically on social media channels (without sounding too braggadocious).